Flutterby House i Uvita, Costa Rica: Bestill nå! Welcome to the Flutterby House - your jungle beach “home” while you're exploring our beautiful slice of this planet. We are proud to be a sustainable, truly eco-friendly hostel, bar, and restaurant, located just a five-minute walk from the beautiful beaches of the Marino Ballena National Park on Costa Rica’s southern Pacific coast. We can help you book local tours and activities including: whale watching, snorkeling/scuba diving, whitewater rafting, surfing lessons, waterfall tours, kayaking, ziplining and more! If you’d rather explore the surrounding area on your own, we rent surfboards, boogie boards, bicycles and snorkeling gear for your convenience. Because we are proud, devoted advocates for our planet, we do not sell or provide any single-use plastic products, including bottles, straws or bags. We recycle, compost, keep chickens, grow produce, and use a biodigestor. We host educational “green tours” every Thursday, to offer our guests and community a learning opportunity for these systems. Come in for a night, a week, a drink, a meal, a surfboard, or even a hug. We look forward to welcoming you “home” to the Flutterby House. 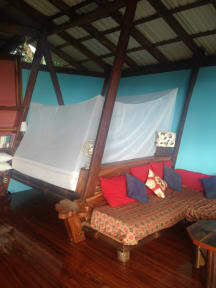 We are located in Uvita, one of the best beaches of Costa Rica. 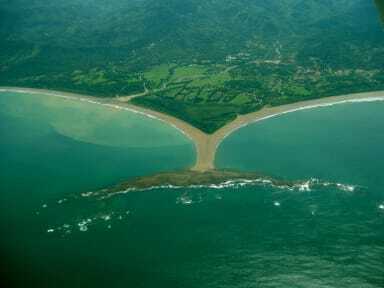 We are just a few minutes away from the beach that is part of Marino Ballena National Park. Furthermore, there are several restaurants near to our facilities in which you can enjoy the best of the cuisine of Costa Rica. Choose from our wide variety of accommodations to fit your lifestyle and budget. We offer comfortable and clean open-air studio apartments, cabins, tree houses and dorm beds, spread over an acre on a beautiful mango plantation. Camping and hammock space is also available. Enjoy waking up to the sounds of the waves and howler monkeys and watch the toucans, iguanas and scarlet macaws in the surrounding trees. We offer a full communal kitchen, yoga deck, bouldering wall, free Wi-Fi, full bar with daily happy hours and activities, and a restaurant that serves breakfast, lunch, dinner, smoothies and snacks. We also provide lockers, secure parking and a night guard for your security. and it will be added to the total due when you arrive. We do not accept customers younger than 10 years of age. Pets are allowed with a deposit of $50.